With fall creeping up on us , at least month wise and so-not weather wise ( in the high 80’s here) we are prepping for the upcoming season. 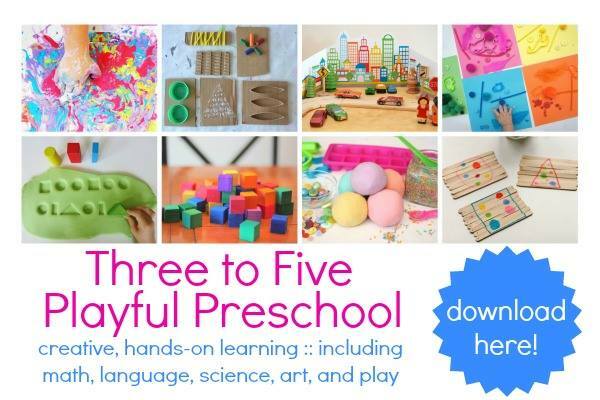 My older one has not started school yet and we have been having lots of fun doing fall activities at home before she heads off to school next week. 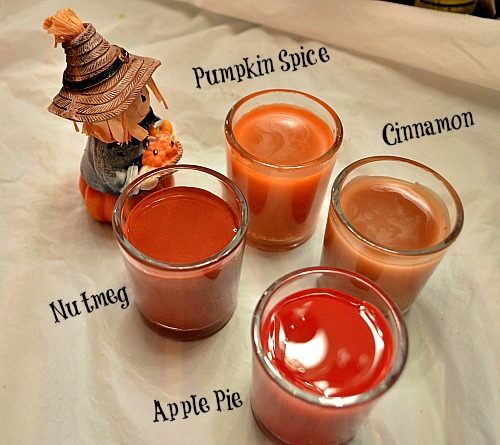 Today is DAY 4 of our fall play recipes series and the theme is “Scents of Fall”. Onto today’s fun. I’m pretty sure you have recycled broken crayons and made multi-colored crayons. We have done it before and my 4 year enjoyed the process very much. She was very excited to see crayons in muffin liners! Today we share a similar fall activity. Ideally for this project I needed a bunch of crayons bits with the paper peeled off. Now I can understand that it is hard to sit and peel off paper for a long time, especially for a testy 4 year who just can’t wait to get to the actual candle making part. 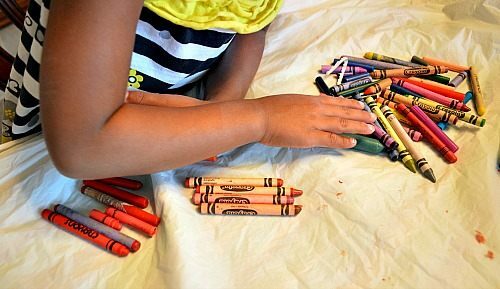 I reminded her about the Hen who wanted to bake a cake story (which happens to be one of her favorite as well) We sat down to peel a few crayons which in itself was a great fine motor activity. We peeled the paper off a few crayons. We also cut regular unscented candles into smaller pieces. My 4 year old collected a few tin cans from our recycle stash and she proceeded to sort the crayons. We had a few reds, oranges, browns and a few shades of browns and oranges. We set up a double boiler system. 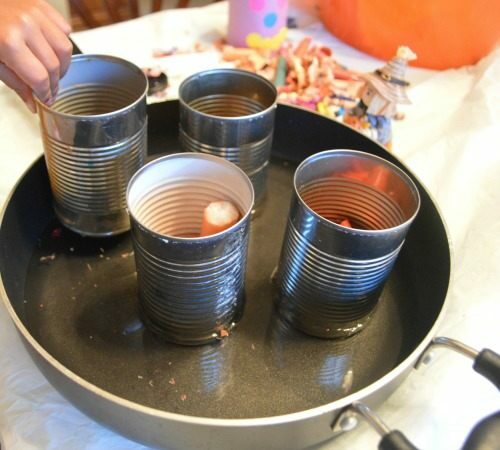 My daughter poured water in a large deep pan and she placed all the tin cans containing the candles and crayons in there. With a medium flame we let the crayons and candles melt. This was the most exciting part for her. She carefully stood up on a step stool and watched ( with supervision) the wax melt and become a “goooey” substance. After a considerable portion has melted she added all the fun fall spices to the cans – apple spice, pumpkin pie spice, nutmeg and cinnamon. We added a really big sprinkling and let the wax competently melt. 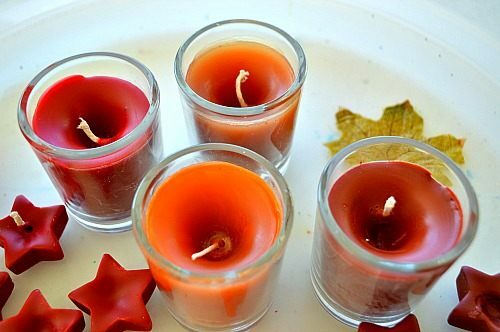 Later I poured the wax in a few basic votive candle cups I had. I even poured a little in the star and pumpkin shapes ice cubes. Unfortunately I happened to spill a tiny bit of melted wax while transferring. As soon as the drop hit the floor, it cooled and solidified. That elicited a ” wow momm, cool! it became a solid” Got to love the hands on learning. 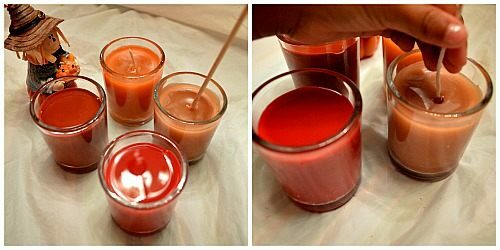 For the wick- I used the wick from the regular unscented candles I used. When the wax partially solidified my 4 year old stuck a bamboo skewer in the middle and dropped a piece of the wick all the way to the bottom. This may not be the best way to do it, but it worked for the kid! 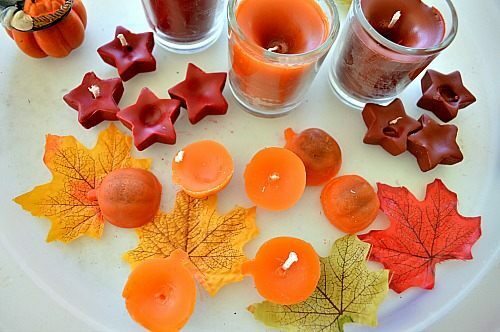 Here are our smaller pumpkin and star candles made using pumpkin shaped and star shaped ice trays. I think they might make a great holiday gift. There are our candles gloriously lighting up in the backyard. 1. I have been told that crayon candles smell bad. Well, I should say that crayon candles don’t smell bad but they don’t smell great either. My 4 year old enjoyed the “PROCESS” and so the activity was worth it. 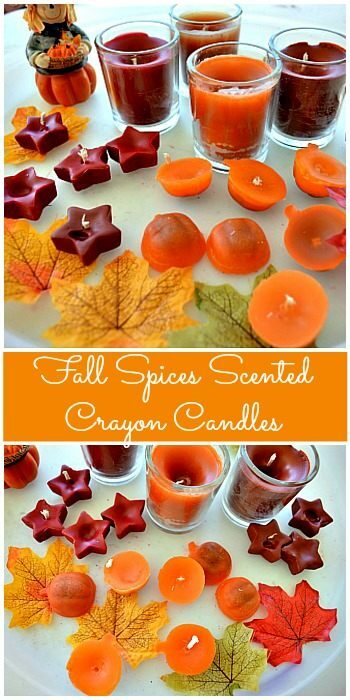 The unscented candles smelled better after the candle making because they took the fall spices so much better than the crayons. We were able to smell the apple and pumpkin spice . 2. Since we are all used to coloring play recipes with food color, please remember to not continue to do the same. 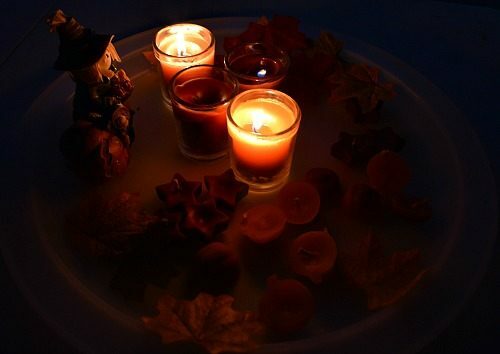 If you are using a white candle and need to add color and scent go for a crayon to add color to the candles. 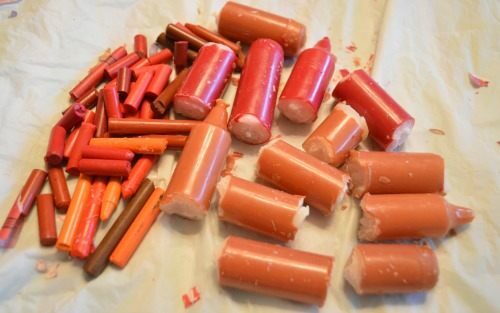 Just adding 1 crayon to your candle wax melt won’t mess up the smell. Add water to the deep pan and watch how double boiling works- she was curious about this method and asked many questions about it. Add bamboo skewer and the wick. Being proud of her creations! 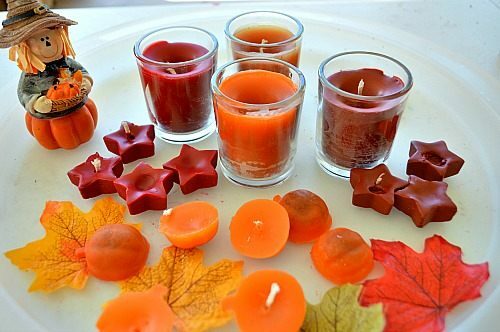 Hope you and your family welcome fall with these fun homemade candles. 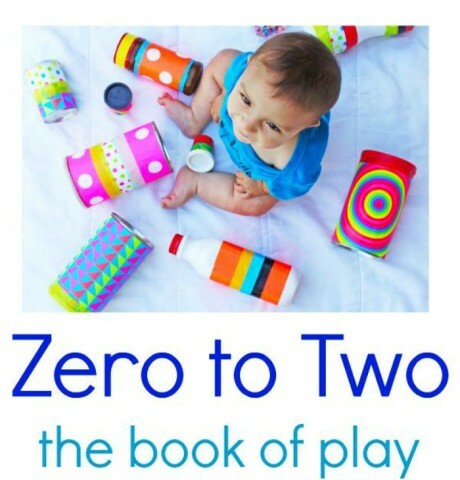 The kids will get a big kick out of this new kind of activity. 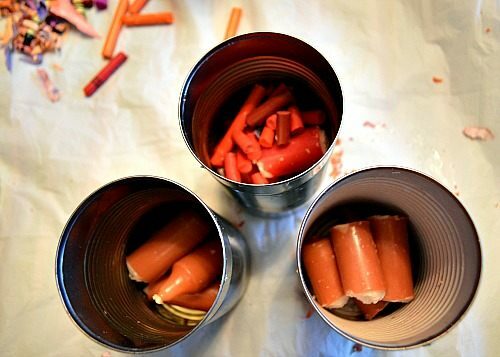 Making candles out of crayons never would have occurred to me. Thanks for sharing! Pinned on my “Fall is in the Air” board. Wow! This is so cute. I will surely enjoy this with my kids. Thanks for sharing. Great Idea! never thought about it. Thanks for sharing.